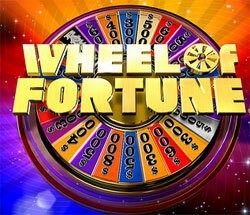 Wheel of Fortune is an American TV game show which uses a wheel the players spin to define the value of different letters. For that matter it may be associated with the roulette casino game. The players are supposed to solve different word puzzles. It brings the contestants cash or prizes. In the process of the game the number of participants which is three at the beginning of the game narrows to a single finalist who plays in the bonus round. In the end, the finalist is supposed to solve the last puzzle to win cash or a prize. The wheel in the game is divided into 24 spaces. They represent values of the letters in cash (just like the black and red color pockets on the roulette wheel represent different numbers), different prizes and penalties, and other specific elements of the game. When the wheel is spun and it doesn't point to a penalty space, the player names a consonant. If he or she is wrong, it is turn of another contestant to spin the wheel. Cash spaces. If a contestant names the right letter, he or she gets the credit. The sum on the cash space is multiplied by the number of cases the letter appears in the puzzle. Prize and Gift spaces. If the wheel stops at one of these spaces, the player has to name a consonant and gets the prize if the sound is correct. Bankrupt. In this case the player loses all winnings earned during the game round. Lose a Turn. Even though the player loses his or her turn to another player, no winnings will be bankrupt. Free Play. The player may either name a consonant at a $500 cost or a vowel for free. Another option is to try and solve the whole puzzle. Million Dollar Wedge. The player is supposed to name the right consonant to claim this wedge and then solve the whole puzzle in the current round to keep it. Jackpot Wedge. There is a progressive jackpot in the 1st round of the game. It begins at 5 thousand dollars and increases when cash spaces come out in that round, just like the progressive jackpot in the Royale Roulette accumulates when the same number comes out with every spin of the wheel. If the player lands on this space, he or she names a consonant and gets $500 every time this sound comes out in the puzzle. Mystery wedge. These are spaces with $1,000 and '?' on them. The player may either name a right consonant or turn the wedge. The wedge may hide either $10,000 or a Bankrupt. Puzzles in the game fall under different categories starting from simple generic ones to the categories connected with puns and word games. Every game round starts with Toss-Up puzzles $1,000 each. The letters of the puzzle are revealed at random and the contestants may choose to solve it at any moment. If the player fails to solve the puzzle correctly, he or she will be disqualified until the puzzle is solved. The finalist - the player with the most winnings throughout the game - will have to play in the bonus round and solve a bonus puzzle. The sum of the prize depends on what space the Bonus wheel will stop at. Each space holds envelopes containing different cash prizes on them or a car. Other contestants will get consolation $ 1,000 prizes.